'Noir Cuvee' is a creation created by the combination of three top varieties: Cabernet Sauvignon, Merlot and Cabernet Franca. Nobile Noir was created by selection of clusters, and with exceptional care it was kept for seventy-two months in small oak barrels. The Year of Excellence was created in a unique series of 2600 bottles. The well-known blogger 'Vinopija' wrote in his diary about it: "It creates its own harmony of cold, living acids and a tiny tan soil melting in the mouth." 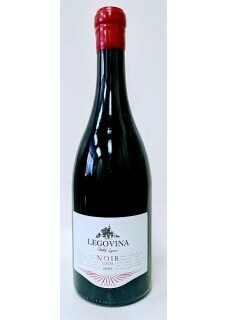 Legovina Noir Cuvee is a wine that is now entering its maturity, endorsing the phrase only for top quality wines, that 'getting older is getting better'. Therefore, the purchase of this Cuvee Noir can be an enological investment in the enjoyment of the drinking of wine, which will become possible to become one of the best Croatian crowns! Food pairing: steak, or grilled lamb.